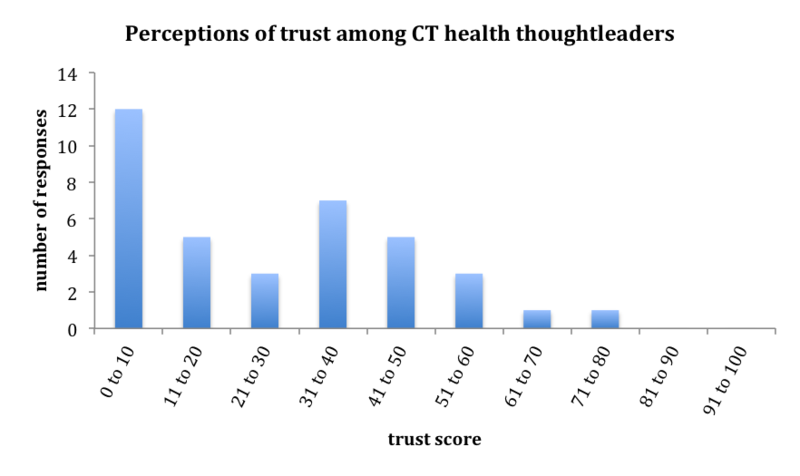 Connecticut health policymaking has trust issues. 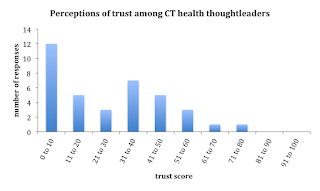 This year Connecticut health thoughtleaders rated trust among stakeholders at only 26 out of 100 possible points, with zero to ten being the most common response. Low trust scores were found in every stakeholder group. Research confirms that trust is an essential foundation to governing and reform; without it no progress is possible. But in good news, Thoughtleaders and the public have submitted 173 ideas to build trust and move forward. They fall into some themes — process/respect, more voices engaged, transparency and accountability, keeping promises, using data and best practices, avoiding political agendas/conflicted interests/ethics, better communications, and a large number of very specific ideas for health system improvement. Click here for the brief, here for the specific proposals, and here for more ideas. We all need to really listen to all voices, look beyond self-interest, and change how we operate. Are we up to that?